Lobelia is most often seen as the little semi-trailing blue, white and purple plants that are used as frothy little annuals in borders and hanging baskets. There are perennial lobelia too and I prefer them. 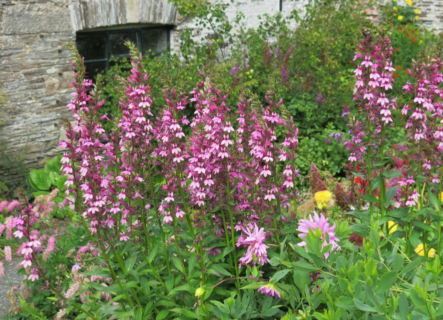 I’m concentrating on Lobelia speciosa; there are just over 30 varieties of them, all of which are in the deep pink, scarlet, purple colour spectrum. Some varieties are very unusual. The most popular is probably ‘Russian Princess’ which has reddish leaves and bright scarlet flowers. We grow a number of varieties which are clump forming, generally getting up to about three feet high (or a metre in new money) so make sure you have the room as they won’t fit in many baskets! They like a fertile soil that is moist but not waterlogged, and they are often planted by ponds. We keep ours in the Walled Garden, which, like the rest of Dartmoor, is reliably moist. If you have full sun or partial shade that will be fine. They aren’t too fussy but as bees love them and they are very brightly coloured I try to plant them in a sunny spot. We use plant supports in our borders so they are secured against the wind. If you leave them unsupported they should be fine but can flop a bit in very windy or wet weather. As a rule of thumb, they should be OK unsupported but pop some supports around the clump if it’s likely to flop onto a path or a lawn. If you grow lobelia from seed you’ll find it is very fine so you’ll get a clump of seedlings to carefully prick out. Just keep the soil moist and warm until germination. I’d water from the base as the seedlings are very delicate until they get a bit more established. With the established plants we have I divide them in spring to make new clumps, so once you have either bought a plant or grown some from seed you should have a good source of these super plants for years to come. Actaea - Black Negliee or pyjamas?